Need a little more RAM to keep your system humming along nicely? You've come to the right place. On Day 18, we've teamed up with G.Skill to give you the chance of winning one of two 16GB DDR4-3200 kits. First prize is a 2x8GB CL16 kit of Trident Z Royal Gold and second prize is a 2x8GB CL16 kit of Trident Z Royal Silver! The competition winner will be picked at random from all eligible entries that arrive by 09:00 London time on the closing date, January 3, 2019. First prize is a 2x8GB CL16 kit of Trident Z Royal Gold. 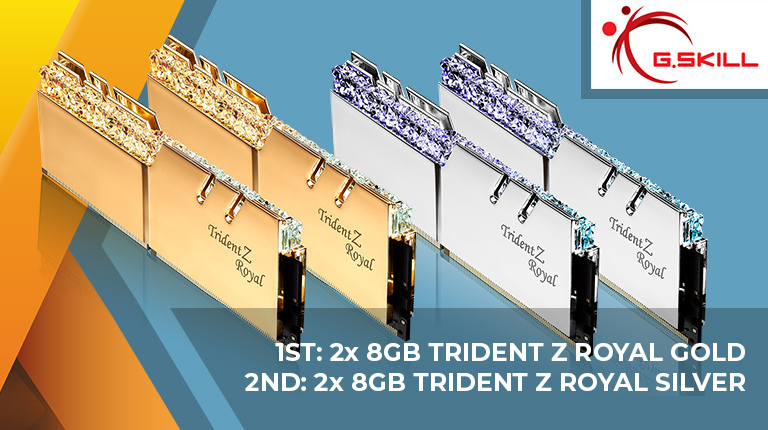 Second prize is a 2x8GB CL16 kit of Trident Z Royal Silver. I wonder if the first place winner will ask to switch places with second place. That gold is a little too gaudy.